Compressed air systems are utilized in many different processes in a variety of industries. Dew point monitoring is often essential with compressed air systems. This is what you need to know about the importance of monitoring dew point. The dew point is the temperature at which condensation will form. This term is familiar to most people from weather forecasts. It is a useful measurement because it correlates to the amount of water vapor in the air or in a gas. Dew point is a term that refers to the dew point of a gas at a pressure that is higher than atmospheric pressure. The dew point temperature of a gas increases with pressure. The dew point is important when working with many compressed air systems. The dew point is not important in some systems. Tire inflation compressors, for example, are not likely to be significantly affected by a variable dew point. In many applications, however, the dew point is important. Pipes with excessive condensate from a higher dew point freeze up if there is too much water. In many industrial applications, excess moisture in a compressed air system may lead to equipment problems. The header pipes made of carbon steel can rust, and pressure vessels can be compromised due to corrosion and rust. Actuators at a production line can rust and corrode due to excessive water making it through the compressed air system. There are many applications that utilize compressed air to provide conveyance like food powders, plastics and even carbon black. These application require dew point be kept low to avoid product contamination. Consideration should also be given to controlling the dryer to the targeted dew point. The atmospheric moisture will change as the weather changes. Therefore, there may be energy savings possible by controlling the dew point. Dew point monitoring can be achieved by installing high-quality dew point sensors and monitors in the compressed air system. The use of a pressure dew point monitoring system allows you to be sure that you are reliably maintaining the desired moisture level in a compressed air system. There are many factors that can affect the reliability of a dew point monitoring system, making it worthwhile to partner with experienced compressor control experts. 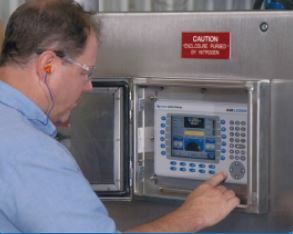 Case Controls provides high-quality control solutions for industrial compressed air systems. Our solutions have been proven over time with a variety of compressors. Contact us at 812-422-2422 to learn how our expertise and resources can improve the performance of your compressed air system.